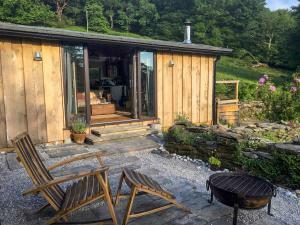 Little Kestrel Cabin is set in Pennal and offers barbecue facilities, a garden and a terrace. Guests are welcome to enjoy the free WiFi. The holiday home is composed of 3 separate bedrooms, a living room, a fully equipped kitchen with a dishwasher, and 1 bathroom. A flat-screen TV is available. Aberystwyth is 31.1 miles from the holiday home, while Barmouth is 28 miles away. Little Kestrel Cabin has been welcoming Booking.com guests since 27 Oct 2018. When would you like to stay at Little Kestrel Cabin? 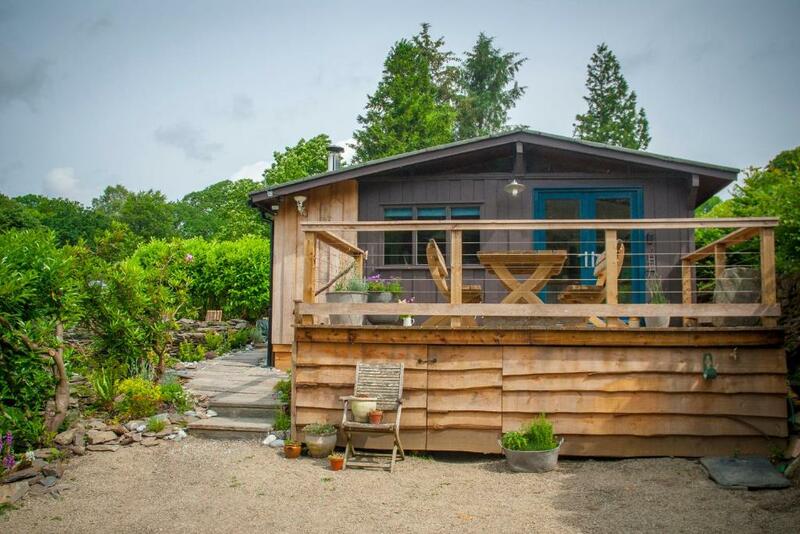 Nestled on an old quarry track within the Dyfi Valley hillside, amongst giant redwoods and pine trees you will find Little Kestrel Cabin. Sitting on the footprint of an old Welsh Lime Kiln, you are treated to panoramic views along the valley, towards the beautiful beaches of Aberdovey, just 6 miles away. Walk 5 minutes along the track and pop out on the Dyfi river, lambs and rolling hills surround you. Douglas Fir-clad walls and an eclectic mix of leather, linen, pine and velvet come together to make a cosy, relaxed stay. 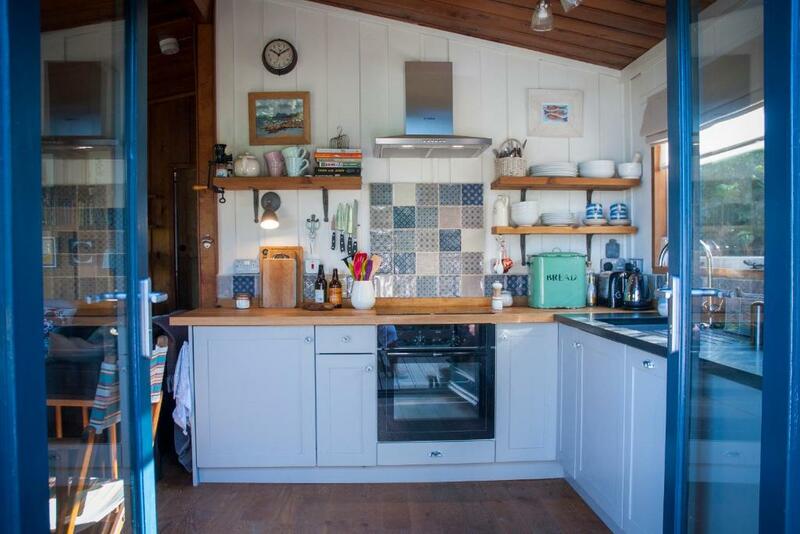 The Welsh slate topped sink and hand painted units create a wonderful welcome to this delightful cabin. A large farmhouse table, wood burner and two comfy sofas for planning adventures, eating and relaxing. Take a book off the shelf and put a log on the fire, or throw the doors open and take a glass of something cold to enjoy the view across the valley by day and Snowdonia’s star-filled ‘Dark Sky’ at night. Run up a mountain, or snooze amongst the Dunes, a wonderful combination of mountain and sea makes Little Kestrel perfectly placed for a relaxing summer holiday, adrenalin filled adventures or a romantic getaway. Our family has enjoyed holidays in mid-Wales for over 20 years, in 2017 we had the opportunity to buy our own holiday home, it has taken us 14 months to renovate it, but at last, we can say that it's finally finished and ready for guests. We employed local craftsmen to help us along the way, which was great as we have hopefully made a few lifelong friends too. When we are not in Wales, I am making jewellery, and my husband is landscape gardening. The views are stunning as are the walks and beaches, local shops and markets are great for getting everything and anything, and just 3 miles away. 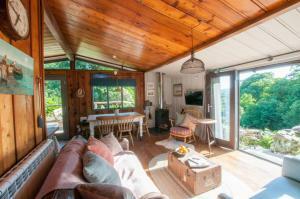 The cabin is truly tranquil with the only sounds to be heard are from the surrounding wildlife. We are situated within Snowdonia National park and benefit from no light pollution, the night skies are amazing. Walk to the bottom of the lane and you are on the Dovey river, see fish jumping and perhaps an osprey fishing for lunch. Drive along the coast to Aberdovey, or put on your boots and take to the hills. Our cabin is truly a wonderful place to stay. House rules Little Kestrel Cabin takes special requests - add in the next step! We need at least 5 reviews before we can calculate a review score. If you book and review your stay, you can help Little Kestrel Cabin meet this goal. One tiny comment for improvement, the kettle is tiny! A bigger one would have been nice for brewing up for all 4 of us! However this is a minimal detail compared to how wonderful everything else was! My husband and I and our friends had the most wonderful stay at the little Kestral. Warm and cosy on arrival, key collection was quick and simple. 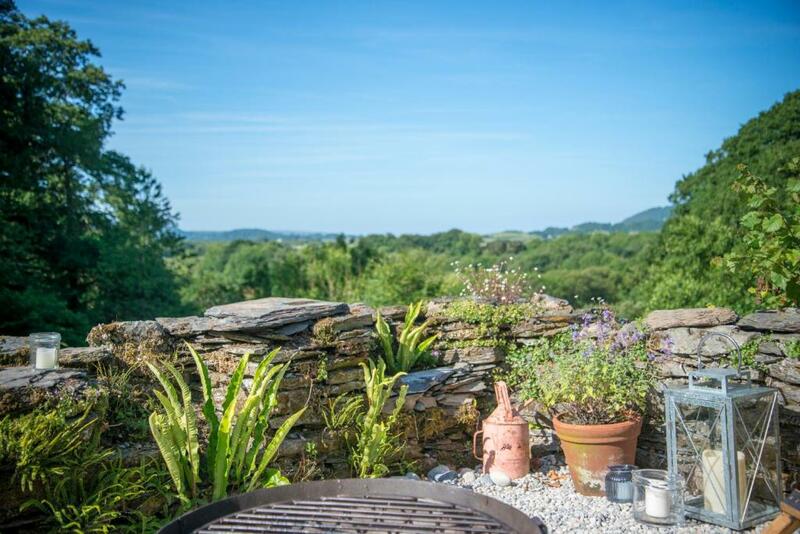 It is the most well equipped self catering property I have ever been to, literally everything you could possibly want or need has been thought about and provided. Highlightlights; The cleanliness is impeccable, the strong signal on the Wi-Fi, and Netflix on the T.V. The beds are unbelievably comfortable and the location/view are spectacular. 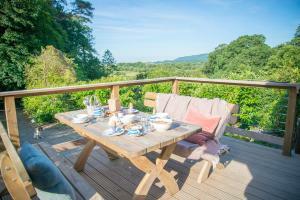 We particularly enjoyed the south facing decking area and the local pub in Pennal was wonderful and a mere 20 minute walk down the lane. Having an electric shower that wasn’t very powerful. Amazing location, beautiful views, well designed, attention to detail, comfy beds, a well equipped kitchen and in the most stunning part of the world. What’s not to like!